ACS, Hong Kong, 30 Sep 2006 - Advanced Card Systems Ltd. (HKGEM: 8210), Asia Pacific's number one supplier in PC-linked smart card readers industry (Source: research report issued by Frost & Sullivan), today announces that ACS has been conferred the prestigious 2006 "World Business Development Strategy Leadership" award for PC-linked smart card reader market by Frost and Sullivan for the company's outstanding achievements within the global smart card reader market. 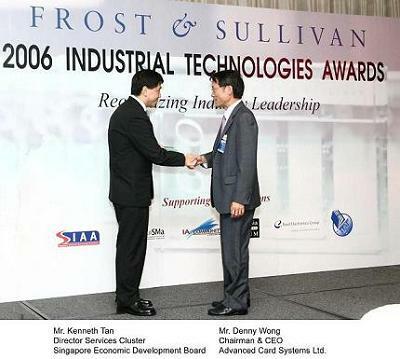 Mr. Denny Wong (Chairman and CEO) accepted the award on behalf of the company in an award ceremony at the Grand Copthorne Waterfront Hotel in Singapore on 22 Sep 2006. ACS was one of many companies honored overall, and was selected as the sole winner for this award in world PC-linked smart card reader market. The Frost & Sullivan Award for Business Development Strategy Leadership is presented each year to the company that has demonstrated excellence in business development within the industry. The Award recognizes the company's ability to best perceive consumer needs, develop products and/or services that meet consumer needs, successfully introduce products or services to the industry, and identify new market segments to expand the existing customer base. Through a combination of vision, technology, and successful marketing, the Award recipient has demonstrated superior market growth skills. To select the recipient of this Award, the Frost and Sullivan analyst team tracks all the major participants in the industry, paying close attention to their business development efforts. This process includes interviews with the market participants, customers, and suppliers, along with extensive secondary and technology research. The company's business development efforts are then analyzed based on the number of new customers, new segments, and commitment to business expansion. Industry participants are then ranked based on the predetermined measurement criteria. The Award recipient is ranked number one in the industry. "We are delighted to stand out from our competitors around the world to receive this award. As an one of the global leader within the smart cards & readers industry, ACS' success not only prove our business penetration strategies, but also its innovative products have no doubt had an immense impact on the world smart cards and readers market", said by Denny Wong, Chairman & CEO of ACS. Frost & Sullivan, a global business development consulting company with a proud history of providing cutting-edge innovative growth solutions and strategies to some of the worlds leading smart card companies, continues its ongoing success in the Asia Pacific region. With a team of specialized smart card analysts within the region, Frost & Sullivan's Smart Card Division is dedicated to researching and tracking various smart card industry trends and forecasts that directly influence Asia and the South Pacific. Their detailed research and rigorous analysis of the region's smart card movements and relevant events provides business intelligence to some of the largest and most influential companies in the world.